Sheen took after his ex-racer Dad, Frank, who also ran a succesful tuning business. Sheene's debut was on a 125 cc Bultlaco at Brands in 1968, although he crashed out after suffering from a seized engine. As a result of his father's links with the Bultaco factory, he was fortunate enough to get a works ride the following season. 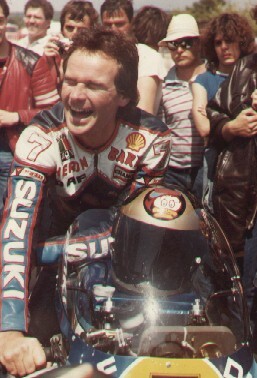 Sheene purchased Stuart Graham's ex-factory Suzuki 125 cc twin and almost got the 125 cc world title, failing at the final round in Spain being beaten by Angel Nieto. A true legend, 2 times 500 cc World Grand Prix Champion in 1976 and 1977 made famous for winning the GP 500 World title and also for two horrific crashes, but continued to race despite all obstacles. He will be sadly missed by all that were fortunate enough to remember his career.